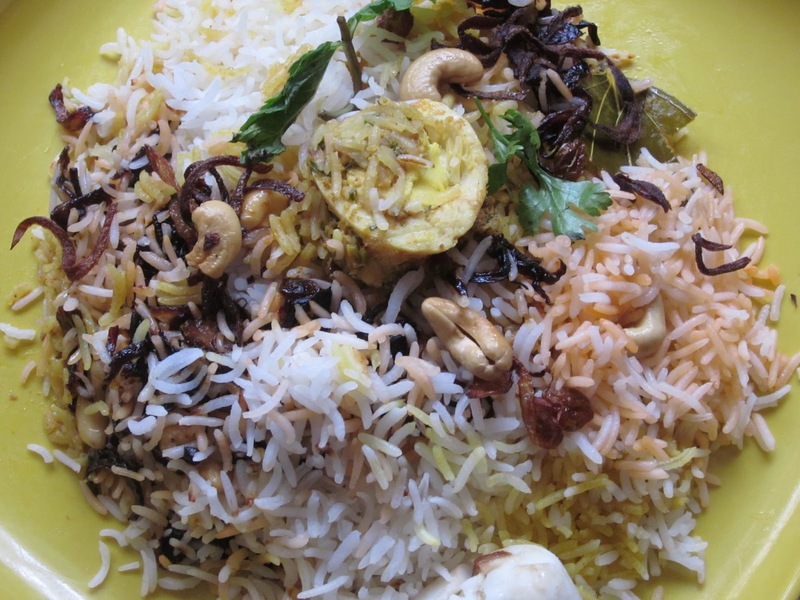 The Tummy Tales: Egg Biryani! There are a few questions that mankind has been to find answers to. Will Sachin Tendulkar ever quit playing cricket? Will we ever find a renewable bio fuel? Is there life elsewhere in the galaxy? Another such question is what came first, the chicken or the egg? And so, while the debate goes on who came first, almost all of us would agree to the fact that eggs in any manner taste delicious. At my place, we have eggs at least once a week. This usually happens we want to have a non-fussy & simple dish that still gives you that “I-have-had-the best-meal” feeling. Remember my post on the “Aloo Saunfiyana”? Where I had spoken about the humble potato winning the most versatile ingredient award in the veggies category, I guess the more suave egg would win hands down in the non- vegetarian category. I have always confessed how much we as a family love any biryani. And when it combined with the goodness of eggs, it doesn’t get any better. Please don’t get intimidated with the long list of ingredients, they are all easily available in the kitchen. Add some love coupled with lots of efforts and you will have a biryani that will remain in your hearts for a long time to come. The one that I made certainly did! To prepare the garnishing, heat the ghee/ oil in a pan. Now fry the sliced onions on medium heat till they turn reddish brown in colour. Take out and drain on an absorbent paper. In the same oil, fry the cashews and raisins until they change colour to reddish brown. Once again, Take out and drain on an absorbent paper. Keep both aside while we shall begin work on the rice. Soak the rice in water for about 15 mins, then wash and drain till the water runs clear. Heat 2 tablespoons of ghee in a large vessel and add in the whole spices (Cardamoms, Cinnamon and Bay leaf). When the spices begin to splutter, add the rice and fry for a while. Now add in water that is double the quantity of rice. E.g. for 1 cup rice you will require to use 2 cups water. Add salt and let the rice cook. When the water begins to boil, lower the heat and allow the rice to cook till you have large and fluffy grains of rice, each separate from the other. Separate a handful of rice from the colander. Now, mix the milk and turmeric and sprinkle over the rice you have separated. In a large vessel heat water and add the eggs and bring to a boil for 10-12 minutes. Once the eggs are done, peel them and cut each into half, lengthwise. Heat the oil in a pan, and lightly fry the eggs on each side till they get a light brown colour. This step is optional, however, I do it to give the eggs slight texture. In a large vessel, heat the ghee and add the whole spices and allow them to splutter. When the spices begin releasing aroma, add the chopped onions and let them cook till they turn golden brown. Add the ginger, garlic pastes along with the chillies. Once the onions are done, add the chopped tomato and cook till it it is limp. Once done, add the chopped corriander& mint leaves. Line a large vessel with ghee. Add the gravy mixture. Now add in half the onions we had fried earlier and some of the fried cashews and raisins. Layer the gravy mixture with the cooked rice. Sprinkle the surface with the rice that was mixed with the milk and turmeric. Place the vessel on a tawa and cook for 20 minutes. Allow it to rest for about 10 minutes even after you've turned off the gas.